It's amazing what you can create when your stuck for ingredients. I was all set to make a pavlova yet what I thought was cornflour in the pantry was actually rice flour.....aargh what was I going to do?? Then I remembered that custard powder is actually made from cornflour with just a little vanilla flavour, sugar, salt and colours added..... so a perfect replacement in my pavlova. Using my trusty Stephanie Alexander recipe (from her book the Cooks Companion) as a base I created the pavlova with custard powder. And wow it actually gave a luscious result. The pavlova becomes a slight buttery yellow colour yet with a divine creamy vanilla flavour. Perfect topped with strawberries, passionfruit and greek yoghurt cream. Place egg whites in a clean, stainless steel bowl of an electric mixer. Beat on high speed until soft peaks form. Draw a 24cm diameter circle on some non-stick baking paper. Place drawn side down onto an oven tray. Place egg white over circle forming a high circle. Place in oven, reduce to 150°C (130°C fan-forced). Cook for 1 1/2 hours. Turn off oven. Keep pavlova in oven, leaving door ajar, and allow to cool for 2 hours or until cooled. Transfer to a plate. Meanwhile, place strawberries in a bowl. Sprinkle over half the extra sugar. Toss to combine. Stand for 10 minutes to allow the strawberries to soften slightly and absorb the sweetness of the sugar. Place cream and remaining sugar in a bowl. Beat on high speed with an electric mixer until firm peaks form. Fold through yoghurt until combined. 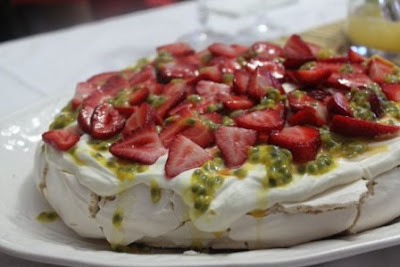 Spread over pavlova.Top with strawberries and passionfruit pulp. Also, I have never cooked or baked with passionfruit, but when I am out I love the little seeds. I must look for them in the store. Thanks for you comment. Yes I love improvising with new additions though sometimes a little tricky when baking, but this one worked deliciously. Passionfruit it fantastic with its exotic tropical flavours and slight zestines which is perfect with pavlova and is cuts through the sweetness of the meringue. It's also love it stirred through greek yoghurt for breakfast.